Audi’s flagship sedan bristles with the latest technology. Much of the car is made of aluminium, and this has ensured the big new A8 feels taut and nimble on the road. Such is the style, luxury and status of the 2018 Audi A8, that many luxury sedans are made to feel somewhat mendicant alongside an A8. There is definitely nothing mediocre about an A8; everything is crafted so beautifully. Decorated with a huge chrome grille at the front of the 2018 Audi A8, the car looks aggressive. The sides of the grille have a distinctive angle incorporated into the perimeter trim, while the inside of the grille has chrome horizontal lines for a nice effect. It appears to have slimmed down for 2018, with a lower profile look making it even more impressive up close. Matrix LED headlamps with laser highbeam finishes off the very pretty face nicely. Looking side on, the 2018 Audi A8 is balanced nicely and flaunts a nice curvaceous rear-wheel arch. 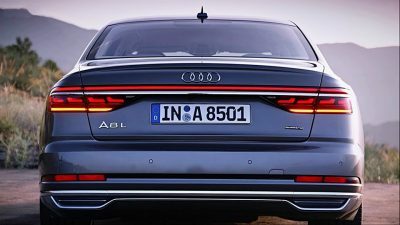 At the rear, the new A8 looks striking with the taillights joined together with a slim light strip underpinned with nice shiny chrome trim. Remarkable Audi A8 interiors are beautiful and stunning to look at and touch. 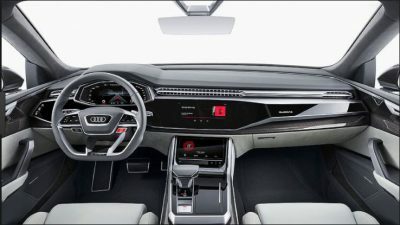 The way Audi designers have integrated the two touch display screen into the centre console does look stylish, and there are a number of interior trim choices offered to the buyer. Leather seats, panelling and dash with accentuated stitching does look so classy, and when you are inside one of these luxury cars you really feel immersed in indulgence. Audi A8’s virtual instrumentation is amongst the nicest on offer in any car, anywhere. Voice command control makes working lots of the car’s features like climate control, audio, communications and sat-nav a breeze. If you’re a rear seat passenger, you won’t be missing out much in the ability to fiddle with some nice features. There is an iPad touch screen for you to alter the temperature for your zone, adjust the seat recline, heat or cool your seat, listen to music, watch a movie and much more. Turn the car on, and the air vents quietly open up and move forward into position. This act will impress anyone unfamiliar with this type of technology. I think Jaguar also features this technology in their cars as well. More impressive modern technology comes in the form of Audi’s parking systems which are able to scan the carparks for adjacent or parallel parks and once you select a parking bay via the AI button, the car will park itself. If the park is particularly tight, you can even jump outside the car and park it via your Smartphone app! 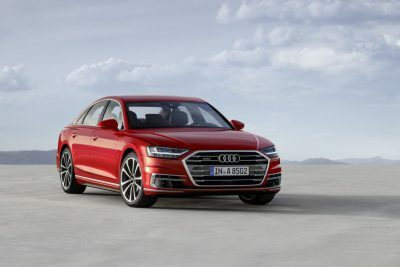 There are parts of the world that allow cars to be driven on autopilot, and the 2018 Audi A8 can drive on autopilot at speeds up to 60 km/h in multilane environments. The driver can sit back and take their hands of the wheel. Another bit of Audi wizardry is the A8’s capability of reading the road ahead, detecting bumps and then adjusting the suspension accordingly to smooth out the ride. An air suspension is standard A8 weaponry that helps to provide amazing road holding and grip. Quattro AWD traction gives the A8 an edge when it comes to fast cornering in the wet. Audi also boasts active wheel steering in their flagship A8 (optional) at the front and rear of the car for extra dynamism in the twisties. The active wheeI steering also makes driving the big limo a breeze in tight city streets. On the go, any of the new 2018 Audi A8 models have loads of grunt and are whisper quiet inside the cabin. Two turbo-diesel engines power the new A8 in Australia. One is the 3.0-litre TDI with 193 kW of peak power between 4000 and 4250 rpm, and a maximum of 580 Nm of torque between 1750 and 2500 rpm. You are governed to a gentleman’s agreement of a 250 km/h top speed, while standard and long wheel base models will run the 0-100 km/h sprint in around six seconds. The other turbo-diesel motor is the V8 4.2 TDI with a colossal 850 Nm of torque from 2000 rpm and 283 kW of power. It might be governed to 250 km/h but it certainly doesn’t mess around in getting up to that speed! A 0-100 km/h dash takes just 4.7 seconds. When safety is considered, the A8 has all the premium features fitted for making this car as safe as possible. One feature that is very impressive is that the air-suspension combines with the side collision detection system to alter the height of the car so that the side beam takes the full force of the collision instead of the door areas. A new Audi A8 is rather winsome, very able to captivate many an appreciative buyer with its charm and elegance. It’s a luxury car with benchmark features. Mercedes and BMW flagships are no longer the top luxury drives they once were. For any more information on the new Audi A8 or, for that matter, any other new car, contact one of our friendly consultants on 1300 303 181. If you’d like some fleet discount pricing (yes even for private buyers! ), we can submit vehicle quote requests out to our national network of Audi dealers and come back with pricing within 24 hours. Private Fleet – car buying made easy!